The last few weeks I’ve been lucky enough to find a couple of laden mulberry trees on my daily travels. The first thing to notice is lots of dark almost blue coloured stains squishing under your shoes, then I look up and… oh hello bountiful tree with your weighty branches filled with red tinged berries. What’s that? You want me to pick me you and store you in my handy empty container I just happen to have with me? Don’t mind if I do. Most mulberry trees around these parts are usually on some one elses property and not within arms reach. Not my arms anyway. However lately I have had easy access to a couple of trees weighted down by all their fruit. Only once I have seen someone else picking the fruit, everyone else seems to walk on by not knowing what it is, or not in the slightest bit interested. Picking mulberries is a bit of a labour of love. The juice stains your fingers and each berry has to be picked individually. Once home, you still have to pick off the little green stems before cooking with, (and I always seem to be in a white top when ever I happen to come across them). It can take a while to get a decent amount, but it’s definitely worth it. Apart from that, my knowledge for urban foraging could use a little upgrade. In the mean time though, at least I have breakfast sorted. Is anyone else enjoying some local free foraged food? Soak whole oats in some hot apple juice. Blitz whole almonds (skins too) until you get a consistency you like (I like it chunky) or use almond meal. Mix in with the soaked oats. Cook up mulberries in a little apple juice, then cool. Then alternate with the layers of oats, mulberries and yogurt. 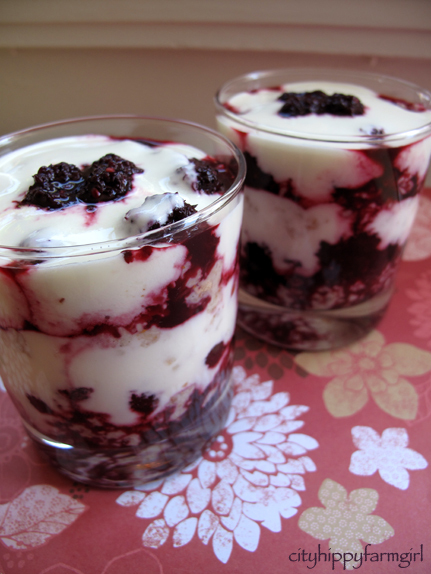 * If you like it sweeter, you can add flavoured yogurt, or a little jam to the mulberries (or sugar). No mulberries? Use any other kind of berry. This entry was posted in Food Glorious Food and tagged almonds, breakfast trifle, food, foraging, healthy, lowfat, mulberries, natural yogurt, oats, sugarless, sydney, urban foraging, wild food by cityhippyfarmgirl. Bookmark the permalink. Even better Jane, when nobody eles knows about it. Enjoy those figs. I’m terrible at neighbourhood foraging. I don’t know the protocol at all and am always worried someone will tell me off, even if the lemon tree (for instance) is completely weighed down and on a nature strip or over their fence. Maybe I should try harder! There are a few Loquat trees that would appeal. You could always knock on some of the near by front doors? I think if it’s on a public area most people are going to be happy about sharing, otherwise they probably wouldn’t have put it in a public area. What a beautiful way to start the morning! I certainly did! 😀 I do something similar with hedgerow berries, slivered almonds, toasted rye bread crumbs and yogurt. Total delish. Winter is setting in around us now so we’re back to hot oatmeal for brekkie. Yum! Great photo too. 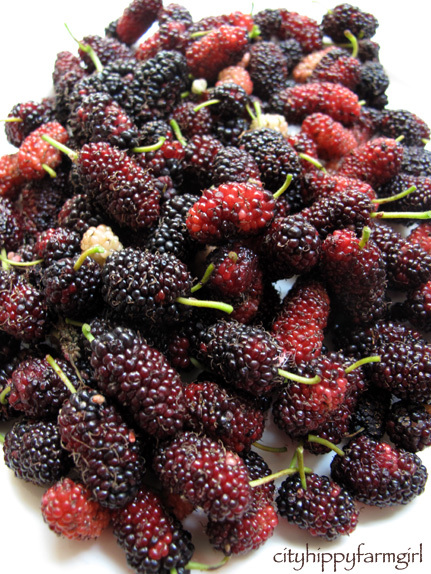 I loved picking and eating mulberries off the tree when I was a kid. It is the thing of childhoods isn’t it. I think I was a lot more patient then too, as I remember full buckets. You’re so lucky. And you’re put these to good use! I also made a apple and mulberry tart with another batch. Just watching a beautiful sunrise out of the corner of my eye, while reading your blog. We have a mulberry tree in our yard and it is laden this year with mulberries. They are a wonderful tree to have .It is also not something you will ever get to buy as fruit in the shops because they are so soft. Good to see you foraging and living off the land.Has anyone ever leant over the fence and caught you ? I imagine no one would mind,… we have a constant flow of visitors during mulberry season. Both trees that I have visited are not within fence boundaries, and in public areas, I’m sure prodominantly the trees just get ignored as there is just SO much fruit on there, saying that I do get the occasional “naughty school kid” feeling. Enjoy those mulberries Kim…and those sunrises. You were rescuing the mulberries from their cruel fate 🙂 Sounds like a great way to start the day. Cruel indeed. Squished and forgotten! I can relate. I had my own mulberry experience not so long ago. They have never been better – so full and luscious and loads of them. What a feast I had for a while there. Never thought to make a breakfast trifle with them – terrific idea. Mouthwatering shot that top photo – yummo! I posted a couple of my mulberry recipes recently if you’d like to check them out. They feel so luxurious to me, not sure why, just do. I’ve never in my life seen a fresh mulberry! How does the taste compare to raspberries/blackberries etc?